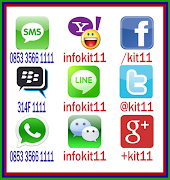 Andrés Iniesta Luján (Spanish pronunciation: [anˈdɾes iˈnjesta luˈxan]; born 11 May 1984) is a Spanish football player. He currently plays as a central midfielder for the Spanish national team. Iniesta did not participate in the 2009 Confederations Cup in South Africa due to a thigh muscle injury. He was called for the 2010 World Cup, and scored the second goal in a 2–1 win against Chile. He was also named man of the match. For his excellent performances in helping Spain reach the final of the tournament, Iniesta was shortlisted for the Golden Ball award. During the 2010 World Cup he scored the winning goal in the 2010 FIFA World Cup Final In a 1-0 win against Netherlands in the 116th minute, removing his jersey during his celebration to reveal an inscription on his undershirt reading "Dani Jarque: siempre con nosotros", which translates to "Dani Jarque: always with us," in tribute of former Spain youth teammate and RCD Espanyol captain Daniel Jarque, who passed away of a heart attack in August 2009. He won the man of the match award for his performance which sent Spain to their first ever World Cup win. Fernando José Torres Sanz (Spanish pronunciation: [ferˈnando ˈtores]; born 20 March 1984), nicknamed El Niño (The Kid in Spanish), is a Spanish footballer who plays for the Spain national team as a striker. 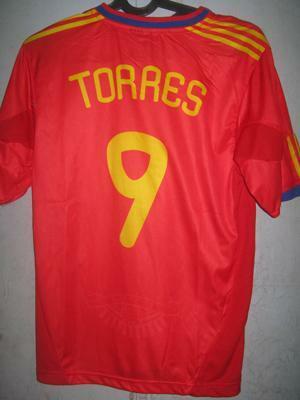 Torres made his 60th appearance for Spain in a 2010 FIFA World Cup qualification victory over Turkey on 28 March 2009, becoming the youngest player to reach this milestone. He was named in Spain's team for the 2009 FIFA Confederations Cup in June. He scored his second hat-trick for Spain after 17 minutes into a Confederations Cup game against New Zealand on 14 June, thus recording the fastest hat-trick by a player for Spain. He played for Spain as they were defeated 2–0 by the United States in the semi-final, as well as the third-place play-off, which Spain won 3–2 against South Africa after extra time. Having undergone knee surgery on 18 April 2010, and missed the end of the Premier League season, Torres' rehabilitation and fitness was closely monitored by Spain manager Vicente del Bosque. 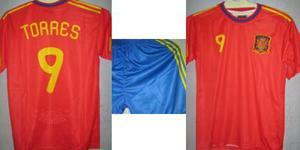 Although still out injured, Torres was selected for Spain's 2010 FIFA World Cup squad in May. On 8 June, Torres made his first appearance on the field in exactly two months, coming on as a substitute on 66 minutes against Poland in a pre-World Cup friendly. He came on as a substitute on 61 minutes in Spain's opening World Cup game on 16 June, a 1–0 defeat to Switzerland. He started the next two games against Honduras and Chile and although his performances in the group stage were described as below-par, he received backing from manager Vicente del Bosque. 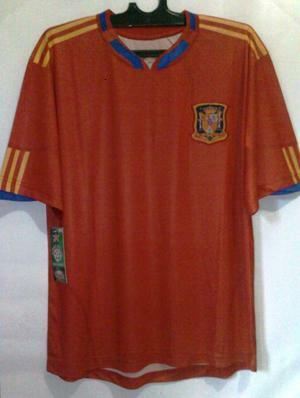 Torres came on as a substitute on 105 minutes in the Final as Spain won the FIFA World Cup for the first time following a 1–0 victory over the Netherlands on 11 July 2010. David Villa Sánchez (Spanish pronunciation: [daˈβið ˈβiʎa]; born 3 December 1981), nicknamed El Guaje (Asturian: The Kid), is a Spanish footballer who currently plays as a striker for the Spanish national football team. He can also operate as a winger. 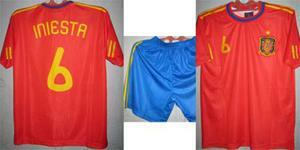 Spain's first match during qualification for the 2010 World Cup was against Bosnia and Herzegovina where Villa scored the only goal of the game. He would go on to score four goals in Spain's next three games, including a last minute winner against Belgium. Another goal during a friendly match against Chile saw him end the year with 12 goals, breaking Raúl's record of 10 goals held since 1999. 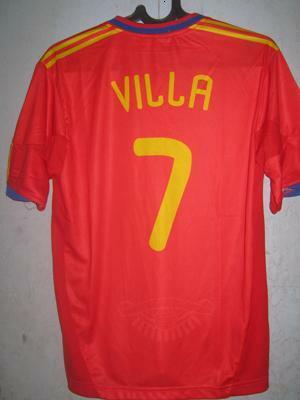 Villa began 2009 with a goal against England in a 2–0 friendly, with this goal, he broke another record and became the first Spanish international to have scored in 6 consecutive games, seeing off records set by Telmo Zarra and Ladislao Kubala. Speaking of the goal he said, "I am very happy with the goal. Truth is, I really want to see it on TV. The record is very nice. I would never have imagined in years that I would be able to obtain it. I am very proud and I hope I can continue breaking records". David Villa (number 7) with the Spain team before a match against Austria. 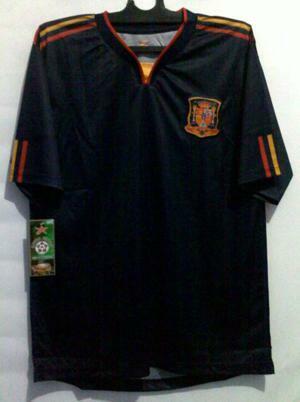 On 1 June 2009, Vicente del Bosque named Villa in his 23 man squad for the 2009 FIFA Confederations Cup. In a friendly match before the tournament, Villa scored his second international hat-trick against Azerbaijan, nearly exactly a year after his hat-trick against Russia at Euro 2008. He débuted at the Confederations Cup with a goal, the last of the five goals in Spain's 5–0 victory over New Zealand, while in the next game he scored the decisive goal against a defensive Iraqi team. Against South Africa, he missed a penalty, but within a minute made up for the miss by putting Spain ahead, helping them equal the records of most consecutive wins and most consecutive matches undefeated before making way for Pablo Hernández. The goal was his last of the tournament but was enough to see him win the 2009 FIFA Confederations Cup Bronze Shoe, he would also go on to make the team of the tournament. 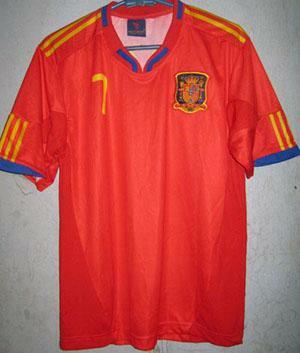 Villa earned his 50th cap during a friendly against the Republic of Macedonia in a match where Spain won 3–2. 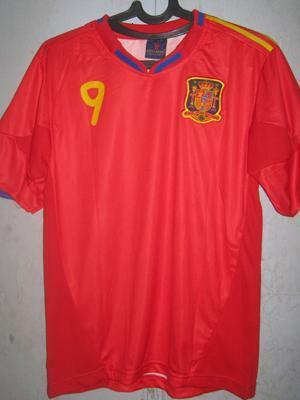 On 5 September 2009, Villa added two more goals to his goal tally for Spain, while assisting twice during the World Cup Qualifier against Belgium, in A Coruña. The match ended 5–0 to Spain where Villa also had a first-half penalty saved by the 30 year old A.S. Bari goalkeeper Jean-Francois Gillet. He finished the year with his sixth international brace against Austria in the Ernst-Happel-Stadion, the setting where Spain were crowned European Champions the previous year. With these two goals, Villa equalled the record he set last year of most goals scored in one calendar year by a Spanish international. 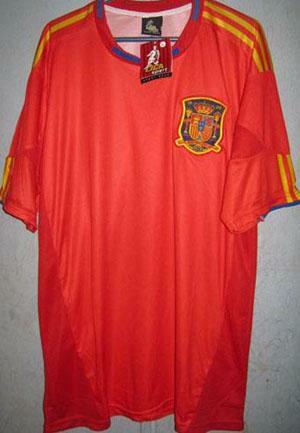 Spain's first match in 2010 came on March 3, against France at the Stade de France. 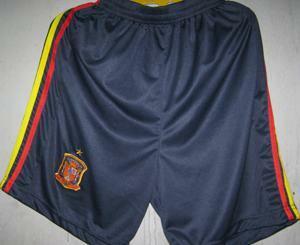 Villa scored the opening goal in a game which Spain went on to win 2–0. In 2010, he came 1st in the IFFHS "2010's World Top Goalscorer at International Level" rankings, he was subsequently selected as a part of Vicente del Bosque's 23 man squad for the 2010 FIFA World Cup. In a friendly against Saudi Arabia on May 29, 2010, Villa scored the first of Spain's goals as they won 3-2 at the Tivoli Neu - the stadium where he scored his hat-trick against Russia during Euro 2008. Failing to score in Spain's next match against Korea Republic, he opened the score sheet in Spain's next match against Poland, a match where Poland lost 6-0, recording their worst defeat in 50 years. In Spain's first 2010 World Cup match, Villa was chosen as a lone striker, but could do nothing to prevent their shock defeat at the hands of Switzerland. 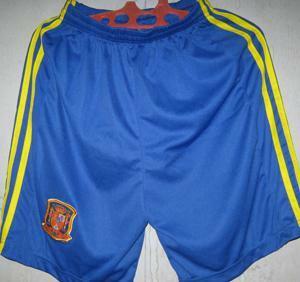 Five days later, Spain defeated Honduras 2-0, where Villa scored both goals, but wasted his chance to complete a hat-trick when he was awarded a penalty kick - side-footing the ball just wide of the post. It was the first time in fourteen attempts Spain ever missed a penalty in a World Cup during the run of play.] In the same game, Villa was shown to slap Emilio Izaguirre in the face after the Honduran player trod on him. Villa said he was "not proud" of the heat of the moment incident, but he escaped a ban. Villa helped secure Spain's place in the round of 16 after scoring the first goal in a 2-1 win over Chile, with a long-range shot into an empty net after Chilean goalkeeper Claudio Bravo ran out of his area to prevent Torres from scoring. The goal would become his 6th goal in FIFA World Cup matches, becoming Spain's all time top scorer at the World Cup finals, ahead of Emilio Butragueño, Fernando Hierro, Fernando Morientes and Raúl González, all of whom have five. 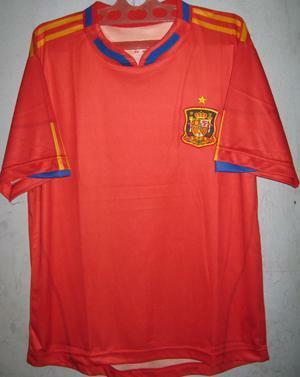 Spain were up against Portugal in the round of 16, and Villa would prove to be vital once again, as Xavi backheeled an Andrés Iniesta pass to the on-rushing Villa who hit the back of the net on the rebound after having his first shot saved by Eduardo, proving enough to give Spain a place in the quarter-finals against Paraguay, where Villa scored a goal from a rebound after Pedro hit the post. Once again, Villa's goal proved to be the difference as the match finished 1-0, while Spain booked a game with Germany in the semi-finals, where Spain recorded yet another 1-0 victory with the only goal coming from Carles Puyol. Villa started in the final against the Netherlands, where he had an opportunity to score from close range, but was impeded by John Heitinga who managed to block his shot. Villa would eventually make way for Torres after 106 minutes on the pitch. Spain became world champions as they went on to win the match 1-0, while Villa was awarded the Silver Shoe, with the Gold Shoe going to Thomas Müller, both players had five goals, however, Müller had more assists. 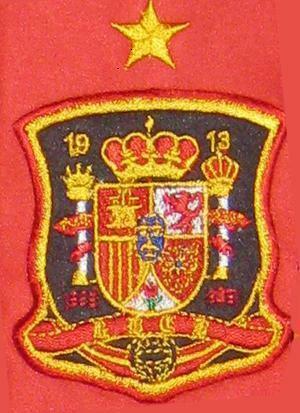 Villa was subsequently named in the FIFA World Cup All-Star Team.